Gulf Harbour Yacht And Country Club: Spectacular Waterfront Estate "The White House" Landmark of the Premier Gulf Harbour Yacht & Country Club! This 14,000 under air and 18,000 under roof Estate home is perfectly designed on Two Waterfront Lots with unobstructed waterfront views from Every Room.Costructed thirteen feet above sea level with a double concrete stairwells down to your own private 225ft of natural sandy white beach. 7 bed 7 1/2baths, 4 car garage, chef's kitchen with gas and electric cook tops, 6 wet bars with refigeration, glass elevator, Media Room, steam room, custom rock waterfall pool with a beach like entrance and a 12 person spa, gazebo, media room, outside kitchen & bar, courtyard with unique water fountain. Separate 2 bed 1 bath guest house w/kitchen and laundry. An Entertainers Dream Home! Bonita Beach: This gorgeous beachfront estate has magnificent unobstructed beach and gulf views! This home is being offered turnkey, and features a great room with volume ceilings and disappearing sliding doors allowing for pool side indoor/outdoor living. The entertaining space boasts fully equipped kitchen with gas stove, granite counters, center island, breakfast bar, wet bar with wine cooler, billiards room, media room, outdoor kitchen and spacious screened lanai overlooking the pristine beach. This concrete construction home features impact glass windows and doors, electric screens and shutters, automated lighting and sound, private elevator, electric gate with privacy fencing and exterior camera system. The home is equipped with a large professional fitness room with state of the art equipment for your home workouts. Right across the street is a walking and bicycling trail that runs for miles. This beautiful luxury bonita beach estate is ready for you to enjoy beachfront living! Bonita Bay: H.14009 - Without question, this home is Bonita Bay's show-stopper! Truly a grand estate home with every imaginable luxury and convenience. With seven bedroom suites, a theater room, game room, billiards room and more. The lavish pool and sunning patios are ideal for entertaining or enjoying privately, amidst the immaculate, palatial grounds, mature trees and gardens. Situated on a 1.3 acre, lakefront lot in Bay Woods, the exquisite craftsmanship, and stellar finishes are sure to excite and delight even the most discriminating of buyers. This property exudes European charm from the minute you pull up to the motor court. For the car enthusiast, there is a five car collector's garage. Bonita Bay is one of SW Florida's premiere golf communities with an active Country Club lifestyle, private beach club and marina, 54 holes of championship golf and state of the art amenities. Come live the Bonita Bay dream! Alva: A special opportunity to own one of SWFL's rare offerings. 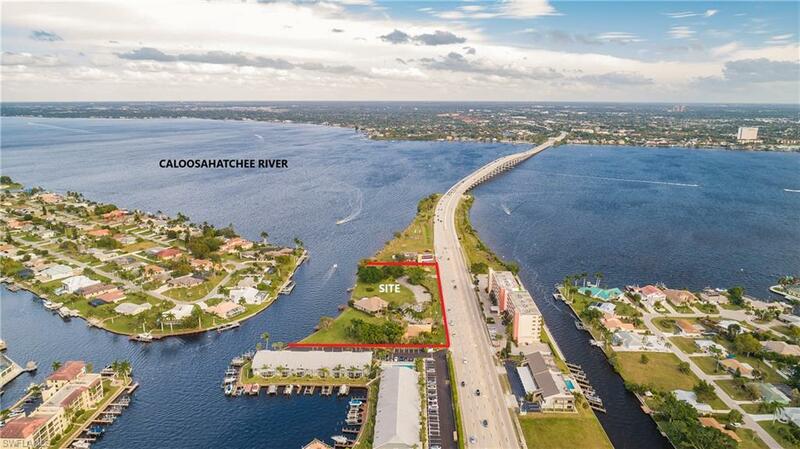 This luxurious property is nestled on approximately 30 acres along the north side of the Caloosahatchee River Intra-Coastal Waterway. This unique location offers access to the Gulf of Mexico (west coast of Florida) and the Atlantic Ocean (east coast of Florida), and the capability of accommodating a yacht over 100'. Once you arrive you are overcome by the luxurious privacy and breath-taking river views anchored by over 4,000 feet of waterfront. Upon entering this impressive residence, a feeling of spaciousness overcomes the senses. The estate offers 7 bedrooms 6 baths, boat house that offers a slip for a larger vessel and a lift for a smaller boat, 90' dock, 3 equipment sheds, generator, zoysia grass meticulous grounds, and caretakers home with 2 bedrooms. The open nature of the design creates an environment perfect for entertaining on a grand scale. Bonita Bay: Quite simply the most talked about house on the river, and perhaps in all of Bonita Bay. There are water and nature views from almost everywhere in the home. Bordered on the east side by the “Fishbowl”, the playground of manatees, dolphins and an endless variety of native birds, and on the west side by the Imperial River, which leads to the Gulf of Mexico. 780 ft of shoreline. A boater and water sports enthusiast’s dream! The home was designed built by one of the area’s leading architects and contractors, on an oversized lot shaped like the state of Florida! The main house has a stunning master bedroom and four guest bedrooms. The guesthouse has two bedrooms. All of the guest bedrooms are en suite. Gourmet kitchen open to leisure room. Sports bar themed game room. Wine cellar. Amazing pool and recreation area stretches between main and guest house. Too much to adequately describe. Must be seen to be appreciated. Little Hickory Shores: Little Hickory Bayfront home available! Located on the widest part of Little Hickory Bay, this 3-story home offers 6 bedrooms plus a study, 6 full baths and 2 half baths. Only the finest details and quality are found in this home and include - high quality custom cabinetry throughout, granite & marble countertops, garage offers room for five cars, saturnia marble flooring, extensive millwork and moldings, 90 degree sliding glass doors and so many other fine details. As you enter this magnificent home, floor to ceiling, seamless glass windows offer expansive views of Little Hickory Bay. Stunning views highlight nearly every room of this home and the master bedroom is positioned to offer long bay views. Elevated dock walks seamlessly to pool deck features double boat lifts, accommodates 4 jet ski's and kayak launch area. Richardsons O L Subd: The Pink House! Magnificent landmark estate situated on 150 feet of prime bay frontage on one of the largest bay front lots (+/- 37,500 sf) on Sanibel. Located at the end of a private shell lane, this home is the ultimate in privacy with breathtaking views. This is a rare point lot with bay and canal frontage and adjoins conservation land. Major replacements in the last year include: All new impact windows & doors, new standing seam metal roof, stucco repair, all new exterior paint, railings & decking. Features include detailed craftsmanship, walls of windows, living room and family room, each with fireplace, four bedrooms including two master suites, one with a new bathroom and adjacent sitting room, private office, gourmet eat-in kitchen, hardwood floors, detailed mouldings, dumb waiter, 2-car garage & more. Remodeled pool adjacent to sandy beach and a completely enclosed lower level. Barefoot Beach: H.13594 - ::OPEN SUNDAY April 14, 2019:: NEW Luxury waterfront living at its finest awaits in this coastal contemporary waterfront home designed by Naples Architect, Jeff Harrell. Generous 3 Bedroom+Den, 5-1/2 Baths offering over 8,022 sf of entertaining space w/4,486 sf under air. The 4th level observation area overlooks Little Hickory Bay, where a wetbar & fitness area open to an airy patio w/outstanding water views. Wide plank European oak floors thru out the entire home are complemented by custom crafted soaring ceilings w/beams, & square edge tongue & groove on every level. The upscale cabinetry throughout the home and gourmet kitchen was designed by Allikriste Cabinetry. Top of the line 48" Wolf Range, all SubZero refrigeration, Meile Coffee maker, 2-ovens, and steamer. The private 95 ft pool deck with 7 ft waterfall, spa & flowing firepots offers a spectacular day/night setting you must experience. The coastal sophistication of this entire home was directed by Ficarra Design Associates. The 80 FT dock with 20,000 lb. lift. All of this just 1,000 steps to one of the world's top rated beaches in the world, Barefoot Beach boasting world renowned sunsets. Barefoot Beach: Presenting Barefoot Beach's finest available luxury bay home. This just completed 4-story Bayfront Gardens home features an exquisite coastal style. Incredible bayfront setting with panoramic views on a very rare western exposure bay lot. 4 bedrooms, true office, top level cloud room w/sleeping & full bath. 5.5 total baths. The main level of this home is expansive w/wide plank oak flooring, a fully equipped bar, priv elevator, & a stunning 11 foot kitchen island. The master suite level is first class taking the entire floor with an enormous walk in closet w/private laundry, wet bar & large space including writing desk space and bay front lanai. The top floor cloud space offers a custom bar and fantastic family entertaining space, full bath, and postcard deck presenting some of the best bay views in Barefoot Beach! The elevated pool area offers exotic decking, sit up pool bar, built in gas grill, & direct access to boat & jet ski lifts. Additionally, this property sits behind two gates & features a private beach access to the areas finest beach! Approximately 7,100 sq ft living space 11,500 total sq ft including pool and deck areas.